Milton is a small acrylic painting from 2012 that debuted at my Galler1988 show, “Inner Nature”. I had always intended to make prints of the image, and few years later we have finally gotten around to it. The time has come for these 100 Miltons to find loving homes amongst you fine peoples out there. Milton will be released in the Shop on Wednesday (tomorrow, 2/26/14), let’s say a bit after 1pm pst. 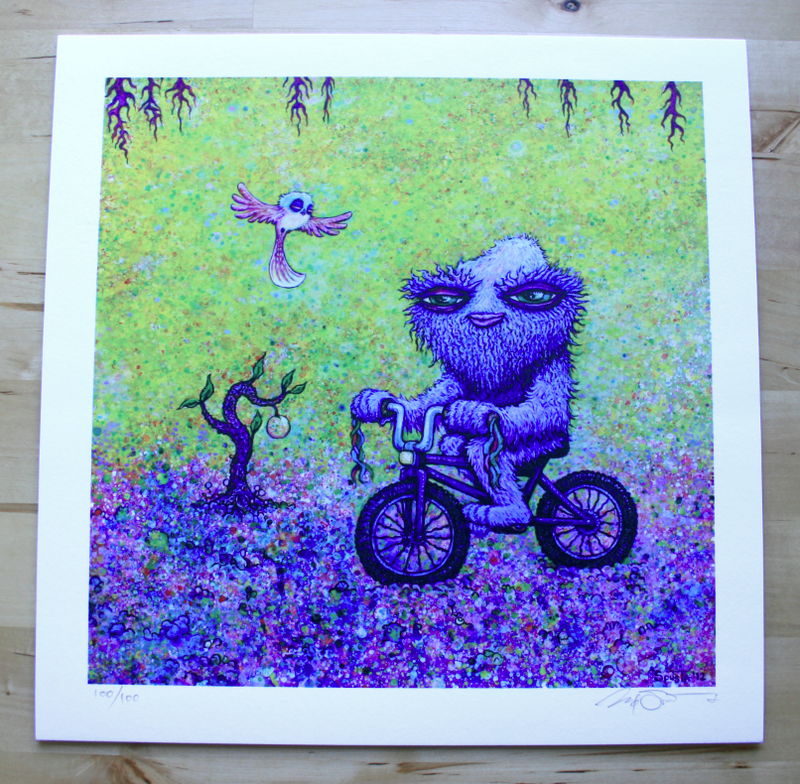 We’re not sure how long Milton will be available, most artwork has been selling out within minutes. Along with Milton, two other items will be made available at the same time. One of these will remain a mystery until it shows up in the Shop. This mystery print is a 10″ x 10″ screen print with a small edition of 50, so they should go quick. 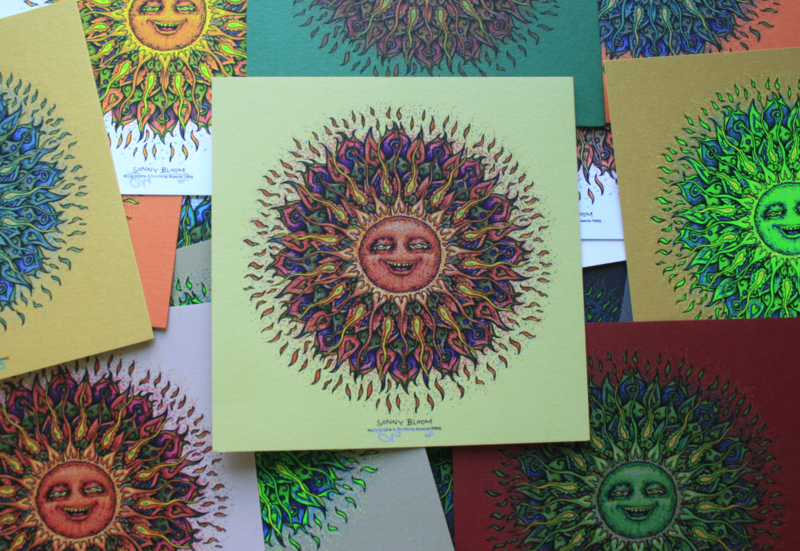 The other item to be released are the Sonny Bloom Mini Print Packs. 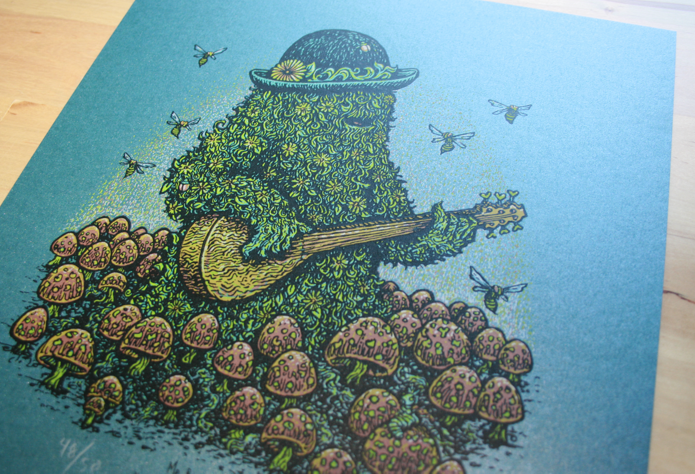 Sonny Bloom is a new 7″ x 7″ screen print in a variety of colors and will be packaged with a few other random mini prints. These 3 items will be shipped flat and can be packaged together if 2 or more items are ordered. As always, we apologize to those customers that experience items disappearing while trying to purchase. The art has been selling out fast, and it get’s tricky to control what happens on the customer end at the moment when the last of the inventory is gobbled up. MILTON MY ♥ FINALLY! Please make it Rain Spusta on me! Thank You Mrs Hollins! Muff is in Love with Milty! Hope he bikes his A$$ to my house! Good Luck Mama 🙂 Luv Ya! Oh yea, been waiting awhile for this one!!!! I just got my first Spusta prints ever on your last mystery drop!! Loved it, but I Love this Milton fo show!! Plus I did not get a scarab or a Seven Birds, so I have to try again!! Thanks Marq; You are the man!! Love all your work & am blessed to be in the Addicts Club; just my bank account does not agree, I am a student so it is tight! How do you know you are a poster addict ?